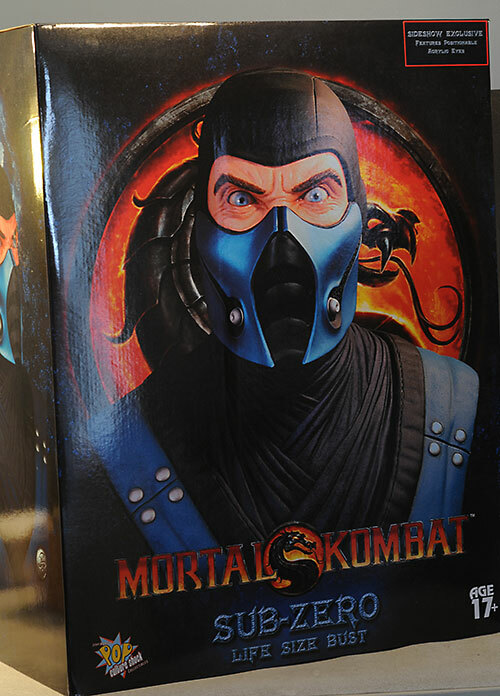 Mortal Kombat remains one of the best fighting games of all time, and there's plenty of product still on the shelves at the local Toys R Us. But high end collectibles have been more sparse, and Pop Culture Shock has stepped in to correct that. Pop Culture Shock is Jerry Macaluso's company, the man who gave us the very cool Street Fighter figures when he was back with SOTA. Fans of Face Off will also know Jerry from Season 2, where he was robbed - but I digress. 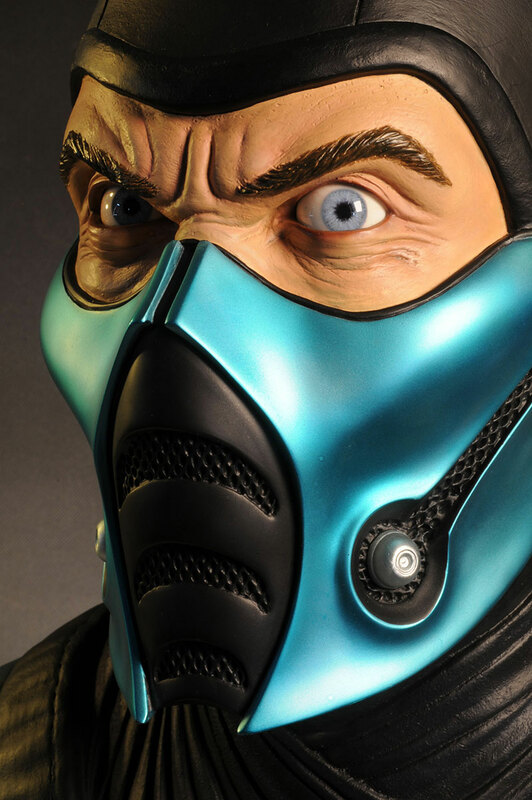 Pop Culture Shock has been doing some great statues for the Street Fighter license, and their first release in their new line of Mortal Kombat life size busts is the very cool Sub-Zero. Yes, I said 'life size'. And yes, that was an awful pun. They're working with Sideshow on these, and there are actually three versions. The regular version runs $620, while the exclusive (reviewed here) is $700. It's also limited to just 100 busts, while the edition size on the regular version is a mere 175. There's a third version that was exclusive to the Pop Culture store that had light up eyes, and it was limited to just 50. The package is pretty straight forward - it's a damn big box, with a dense foam trays that keep everything safe inside. The exterior has the edition size and number, and there's a Certificate of Authenticity as well. The info is also on the base, just in case. 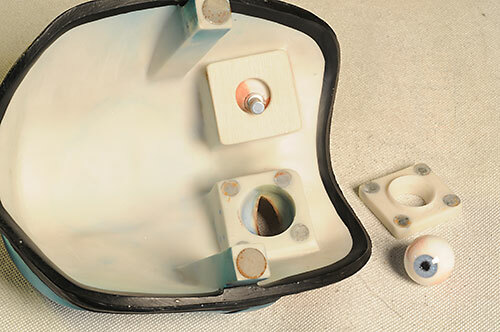 The eyeballs come packed separately, and are labeled in the tray right and left. The eyes themselves aren't labeled, but if you put them in the wrong spot, you should be able to figure it out. This is a full size bust, coming in at about 22" tall. That's huge, and even with the swoop back design, it's still pretty heavy. Like most 'life size' busts, it does seem slightly too small to me, but I have a big head, so I might be biased. 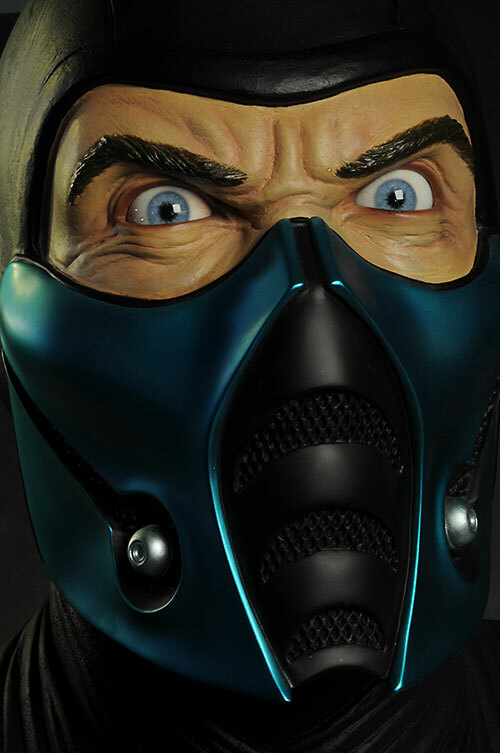 The skin texture looks great, and the smooth mouth mask contrasts nicely with the black head covering. There's lots of small detail work, including the eyebrows and clothing. The eyes are glassy and solid, and look extremely realistic. I assume they are individual balls on the regular version as well, and not just the exclusive, but simply don't have the extra posing feature. Doing them as a separate piece was a very wise move, and even though they are separate, they don't seem too deeply set (unlike some of the Hot Toys PERS figures). Of course, part of that is due to the scale, but it's also because the fit is well designed. 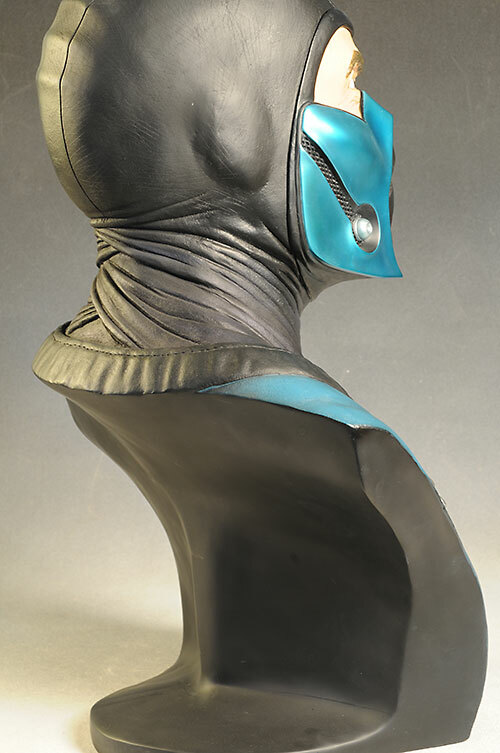 As I mentioned, this is a bust that has something more going for it than just a great sculpt. The exclusive includes posable eyes - how cool is that! The way they've gone about the feature is also very creative. 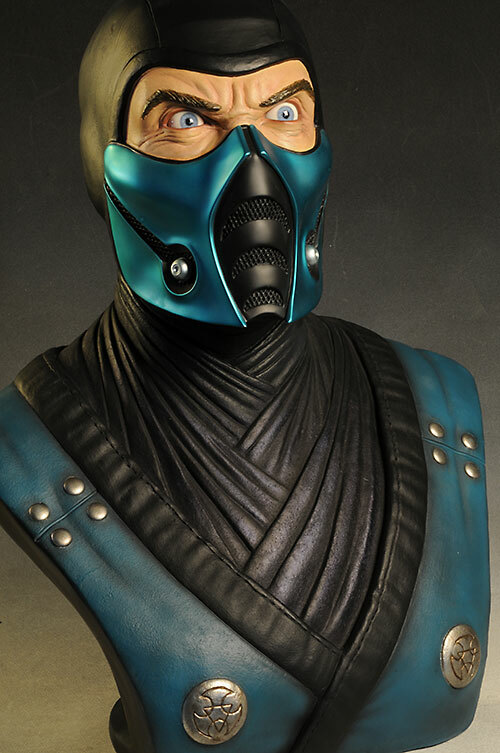 First, you remove the entire face, from the top edge of the mask to the hidden underside of the jaw. If you didn't know it was removable, you'd never notice it - it's that well hidden. The face plate is held on with VERY strong magnets, but if you grip it underneath the chin and lift, it pops off. On the backside of the eye sockets are two square plates, also held on with strong magnets. Pull these off, and place the included eyeballs (complete with metal adjustment rods) in the socket. Replace the square plate, and you are all set. Just move the metal post on each eye to get the exact position you want! The sockets aren't the exact same sculpt. The left eye is open a smidge wider than the right, and it takes a little effort to get both eyes lined up just right. Once you do, they stay put and look great. This eye feature really makes this bust stand out, and the design is simple yet very effective. If there's one issue, it's with the eyebrows. While the hairs are pretty detailed, they still end up throwing off the realistic look of the rest of the bust, at least a bit. The paint is clean and sharp all around, and colors are consistent in coverage, tone and finish. The clean, consistent paint improves on the look of the already great sculpt. One of the best aspects of the paint job is on the glass eyes. They painted in a bloodshot look on two sides, with the other two sides a lot more white. That gives you even further options with posing the eyes - turn them one way or the other and they are more or less red! Since the eyes are acrylic, they have a glassy covering, not just a glossy paint finish. That adds depth to the eyes, and further adds to the realism. Regular readers know that a **1/2 here means this is an average value, which translates to no effect on my overall either positive or negative. That score might be surprising when something costs $700, but you'll find a pink unicorn before you find a cheap life size bust. If you're getting into this type of collectible, you better expect to spend several hundred dollars (and more) a pop. Several years ago, the Iron Man bust from Sideshow was $700 as well, and even the more basic Frankenstein from Factory Entertainment was $500. The movable eyes here is a really cool feature, and with such a small production run, the exclusive is worth the seven bills. I will say that if I were looking only at the regular release, I'd probably knock a half star off here. 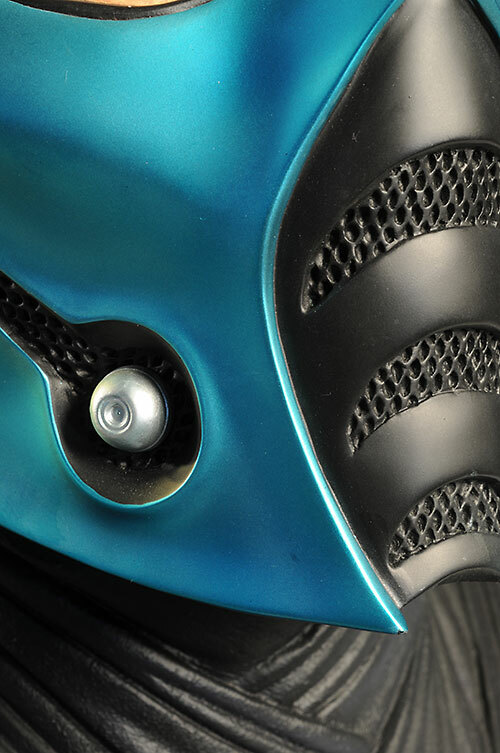 It's the smaller run size and eye feature that gives the exclusive the edge. If the eyes seem too loose or too tight in the sockets, you may have gotten them switched. It does matter which goes in right and which goes in left, and when you have them correct, they fit snugly but not too tight. It's not easy to be a collector of life size busts. You have to have a fat wallet AND a big house, and not many of us have either, let alone both. But for serious fans of key characters, adding in a life size bust to a collection of smaller items can create a center piece for the display. If you're a big gamer and fan of 90's fighting games, then this guy is definitely worth a serious look. Finding one now might be tough with such a low production run, but the search will be well worth it. It's the moving eyes that sets him apart, and I'm not sure I'd be as gung-ho on the regular version. The eyes are engineered to work in such a simple way, and yet it's extremely effective. If other companies are looking for something to copy, this would be it. 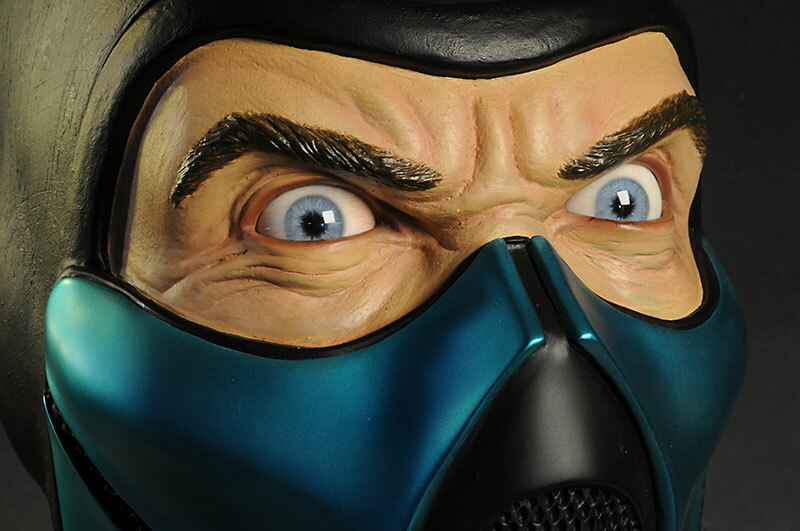 Sideshow has two versions of this bust - the regular for $620, and the exclusive for $700. The exclusive has the movable eyeballs you see here. You can search ebay for a deal. 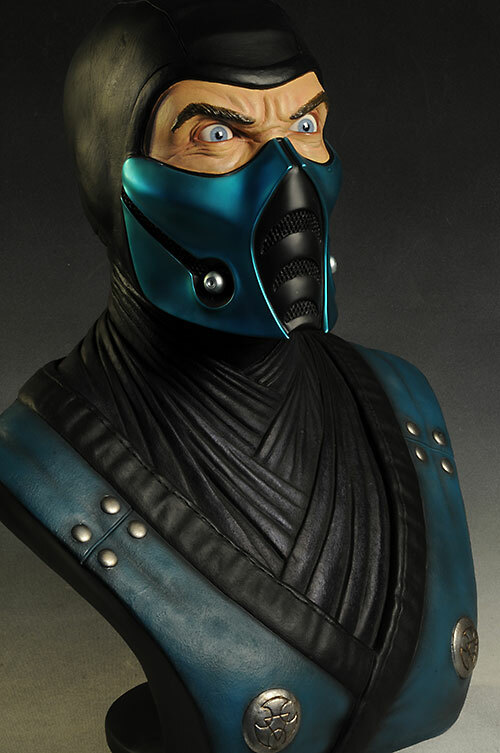 Other Mortal Kombat reviews include the smaller action figures of King Lau and Liu Kang, Sub-Zero and Baraka, and a guest review of Raiden and Scorpion.